As you might remember from another post, I am going to free Japanese classes lead by volunteers every week. Last month my teacher from Thursday's class informed us that an international festival was coming up, and that the Japanese classes were to send representatives to hold little speeches. She asked me if I could imagine holding a speech and I replied woohoo and yay! Now in my first 原稿 manuscript I intended to talk about the bad things foreigners have to deal with in Japan, balance it out with good things and arrive at some synthesis. I would talk about Japanese people sitting away from foreigners in the trains and subways and of the new foreigner laws forcing every foreigners to give finger prints to the Japanese government for a life time sentence. The latter is justified with the danger of terror attacks on Japan, like in every other country. However the only act of terrorism ever executed in Japan (e.g. the gas attack on the Tokyo subway) was committed by Japanese people, who do not even need an ID and do not need to give their finger prints either, while foreigners have to carry a foreigner registration card. However this speech had some problems. The topic I chose was not an easy one, even in German or English talking about such political issues, especially when the terrorism pretext, in which many people still believe, is included, proofs to be a very delicate difficult matter. Speaking about it in a language, which I am still learning and improving on is therefore sheer madness. On the other hand time and location were just not fit for such a speech, since the festival aimed at bringing foreigners and Japanese closer together and abolish fear and doubt. Such a speech in such a scenario can easily backfire. After my teacher made me realize this truth, I agreed and changed the topic entirely and decided to make a "cabaret" like one man performance talking about my adventures in Japan. As a title I choose 日本と言う冒険 The Japan Adventure. I will post the original text at the end of this post and give a translation for it. Then came our speeches. I was nervous like hell and got stuck at some points, mainly because I had to learn to speak the speech from my memory in advance to allow me to act while speaking. But in the end it turned out quite well and people were laughing and anticipating my next act (I partitioned my speech in Intro, Outro and 5 acts). Apart from me there was another really cool speech from a girl from Costa Rica. Her speech was 日本で三つの好きなこと or in english 3 things I like about Japan. First was Natto and last was the free Japanese classes, but the middle one was very cool. There she would talk for 5 minutes about a very special toilet she found in an organic fair trade store in Atusgi, and how wonderfully decorated the toilet was, so that after she did her business, she would not leave the toilet for 10 minutes. Then she all recommended us going to this toilet and see for ourselves. More than that, after she finished she told us that she'd like to sing a song from Costa Rica and started singing. They played some music as background, but it was never practiced beforehand, so nobody knew, that she would be singing for over 10 minutes. After 5 minutes however the audience had sightly enough and the moderator grew timid. After 7 minutes they cut the music, but after she still didn't stop singing turned it on again and everybody had to last till the end. Ho ho I like that, she's a real rebel in my eyes. Also cause like this she brought some Costa Rica culture to everyone and in the end benefited the cause of the festival. Next was a really nice duet between a piano and a clarinet. And after that a group of 7 Indian dancers, who performed two really cool dances, where they would incredibly move their head horizontally to the right and left without turning it. I tried it myself and cannot even move my head one inch in this way. They also used their eyes in a cool way according to the dance. It's the first time for me to see a dance like that, where the focus is on the strafing head and the eyes. "Is it the first time you are going to Japan?" "Yes, the first time to really leave my country. The first time to really experience a different country and culture. I am all excited about it." "I see. In that case you'd better be careful. See ya!" "Be careful? Is it dangerous? Hey wait! Don't run away! Hmm I wonder why he told me to be careful?" And that's how last year in July I ended up coming from Germany to Japan. Boah how beautiful! I've seen that one on pictures, that must be Fujisan. Yeah let's go, I want to go there. Oh cool there's a bus heading for it and there's still an empty seat in it. Huh? Only one empty seat? I wonder why so many people go there. Cool I'm there. Woah! As I though it's really tall. Well decided is decided, let's mountain climb. Oh my, I am only half way to the top, but there is an incredible amount of people here, so that going on has become really tiresome. I don't believe this country! On a mountain that high you can get stuck in a human traffic jam! Incredible! Fianally, I reached the top, yesss! But wow! There are so many people here! Both young and old, I wonder how all of them manage the tough climb. Amazing this country. I have enough of mountains, let's go to the city. Huh?! Another mountain? No wait that's a building there. And a really tall one too. A building like a mountain! What? Over 200 meters high, amazing! Ahh! Help me! The toilet is broken! It is spraying water at me! I am a man! As expected, I have no choice but to get stronger! This country is well known for its formidable martial arts. That's decided then. I will become a martial arts fighter! Okay let's see where the next Dojo is. Aha! Hmm I wonder why everyone in here is wearing black garments. Oh because they are Ninja, I see. Well and what am I supposed to do now? Ouch Ouch! What in the world is going on? I had no other choice but to run away again. Lately I have been running away a lot. Maybe I should go a little away from here. Ah! What in the world is happening? Damn it! What should I do? Ah I've seen that one before in Anime! It's a giant. 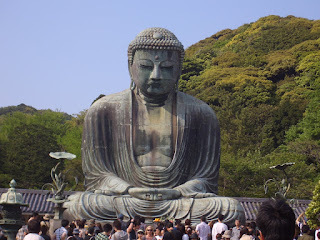 I bet this huge Buddha there is causing the earthquake. "Hey giant! You'd better stop that, because I am a real Ninja!" It stopped! Ho ho ho, as I thought I proofed to be stronger. Well that being settled let's return. What? Because of the earthquake all buses and trains were canceled? Damnit what should I do now? *sniff sniff* I have enough of both humans and cities. I wanna go to the nature. And think about my future in the midst of trees and mountain rivers. Great! You can do a pilgrimage on the island of Shikoku. Yes that's what I'll do. Woah! I can really wear these cool pilgrim's cloths on the pilgrimage? Thank You! I don't quite understand this map, but I have a compass, it should be ok. But damn! It's really cold here on top of the mountains on Shikoku around new year. There is a lot of snow here. And I got neither sleeping bag nor a place to sleep in. Damn it, I guess I am in real trouble. "Hey boy! I know a mountain hut in this area, where you can sleep!" "Oh wow! Thank you mister! Is it your hut?" "Oh no! The hut was built by a real Buddha, who opened it for free for all pilgrims." "You know, in reality I am nothing more than a homeless person on a pilgrimage for his whole life. But I like to draw and have some pictures here. You want to see some?" "Hey man, they are wonderful! You are really talented. Damn, I want to support you a little and buy a picture from you, can I?" "No Way! We have become friends, so of course I give it to you for free as a present!" "But but since you are homeless, I think its ok to give you at least a little. Please close your eyes!" "Well we are leaving now downhill. Thanks for everything and take care!" Oh man! It's really cold today. I wonder if we'd be able to find a place to sleep until the night breaks in. As I feared, we didn't find anything. Well there's no other choice, but to sleep out in the open. "Hey boy! I have some warm coffee over here. Don't you wanna come over and rest a little in my home?" "You know, my 77 year old mother also made this pilgrimage for over 70 times, mostly not for herself but for other people." "Ohhh pilgrims! Tell me, where have you slept last night? Ohhh on the outside? Incredible. You have slept like real Buddhas. I want to support you a little." "Oh no way! Wah can't accept that, that's way to friendly!" "No no it's ok, take it! nd my son here is going to the station, he will take you with him!" So after all this old lady proofed to be the real Buddha alive. So that were my adventures in Japan until this day. They have become wonderful experiences, which I will not forget for my whole live. When I was speaking the speech above, I was dressing according to the act. E.g. with a black bandanna and a plastic katana in the Martial Arts part, and as pilgrim in the last part. For Fuji and the giant I was showing the pictures you can see above. And for the toilet I was using a chair.